Who/What: “Experience Awesome” once more as Valencia premieres the Charleston at River Village – a new neighborhood by KB Home. 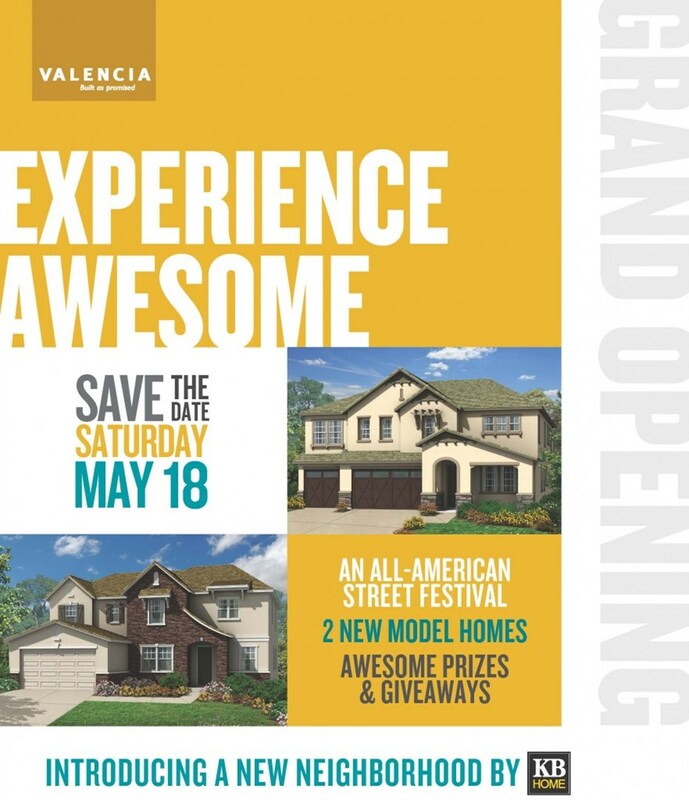 Explore River Village’s traditional small town character and Americana theming during the model home Grand Opening and All-American Street Festival on Saturday, May 18. Join us from 10am-4pm as we celebrate and showcase the model community in true Southern California fashion – with food, fun, and sun. In addition to model home tours, the street fair will feature a cool hot dog stand, Del's Lemonade, face painting, music, and more. The Charleston community is designed to reflect what KB Home's customer surveys have told them homebuyers are looking for - bigger homes with more bedrooms, state-of-the-art energy efficiency, higher-end options, and flexible floor plans that allow for personalization. This community of new homes is part of the gated River Village and features recreation centers, parks, river trails, and a small neighborhood retail center as well. New single-family homes at Charleston in RiverVillage will feature approximately 3,777 to 4,715 square feet of living space. With four to six bedrooms, three and one-half to six and one-half baths, these homes are perfect for growing and extended families. So bring the kids, come hungry, and kick off your summer in Awesometown. When: Saturday, May 18, 2013, 10 a.m.-4 p.m.
To RSVP or for further information, including press inquiries, contact Hanna Williams at 949.607.9301 or Hanna@patriciancompany.com.